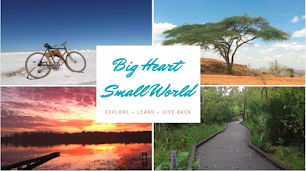 There are many things you take for granted that you realize while traveling. It could be cold cereal in the morning or soft bed at night. It might be your closet full of cloths or maybe some clean socks. Maybe its something as small as a normal outlet to plug your computer into or maybe its as important as electricity. One thing I missed was a good old shower, not one of the fancy ones with jets on all sides or one of those huge ones that simulate rain. When you have to ask for a bucket for a shower and pay for extra and wait five minutes for hot water to add to your bucket of freezing cold water you reminisce of the shower at home. A good "bucket showers" is hard to achieve, it takes a lot of practice, mistakes, and aha moments. When you pour the water over your dry cloths, or if you run out of water before all the soap is off or maybe you leave the shower with dirt still behind your ears (what did your mom say?) you will realize how hard of a task it is. While traveling in India and Nepal and through my many experiences hiking into the back-country I have perfected the "Bucket Shower". First is Bucket shower anatomy. You have the main water vessel and a smaller hand held bucket. The small bucket is to use as a pouring device and the large bucket a reservoir for the water. Second thing to think about is that water is limited, sometimes only a gallon (3.7 L). A low flow shower uses about 7-8 gallons every 5 mins and older shower heads can use up to 20 gallons in 5 mins. Another consideration is that you usually are only packing one of those travel towels, that at best cover your abdomen. 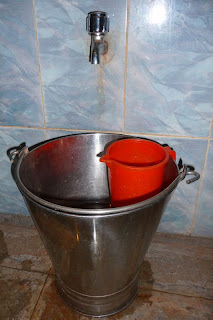 Bucket showers can get messy, usually in India and Nepal, there are special rooms or sections of the room for taking bucket shower (usually has a drain). There is usually not much storage space to put your cloths or bathing items. Bucket showers can get messy, water usually flies everywhere as you pour it on yourself, so make sure your cloths and towel are far enough away to stay dry. Shampooing and conditioning is not always an option. A two in one conditioning shampoo can help greatly in these situations. Trust me you don't want soapy hair afterwards. Make sure when you pour the water over yourself that you are not standing over the bucket, otherwise you will contaminate your only water source with soapy runoff. First pat on a small amount of water and then add soap, soaking your hair in the small pour bucket will help reduce water loss and wet your hair thoroughly. You might be in many different situations, maybe its freezing cold, maybe you are in public or in an open area, maybe you are in nature. You must be able to adapt to the situation. If its cold, no matter how much you want to, don't pour slowly, you will just prolong the suffering. On the Annapurna Circuit it was often below freezing and normally the water was just as cold. Sometimes the showers were outside with only a wooden division to protect you from spying eyes. Make sure you have your warm cloths close, socks and gloves included. If you want you could pay extra for a small addition of hot water to your bucket. This could be worth it once and a while. 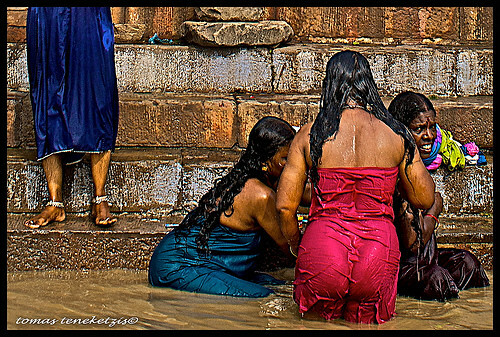 Women in India if in public usually bath in a saree-like cover wrapped around them. If you are a women that has to bath in public make sure to wear fully covering clothing that dry quickly. This can also help in homes where the bathing area is open to the rest of the house. Often a family with bath together. I hope when you receive your first bucket you will remember my post and come up with your own perfections to the "bucket shower". Happy Travels. I guess you've got to do what you've got to do. I think going to India during monsoon season would solve the shower problem.